Travelers looking for a Patagonian experience with the comfort of full service luxury choose Llao Llao Resort, Golf - Spa. Travelers looking for a rugged Patagonian experience, with the comfort of full-service luxury, choose the legendary Llao Llao Resort, Golf - Spa near Bariloche. Located in the heart of Argentina´s lake district, it is reminiscent of a grand mountain lodge, complete with exposed cypress walls and oversized stone fireplaces. Many guest rooms offer views of the Andean peaks and lakes; particularly impressive are those from the deluxe Lago Moreno wing. The area is a haven for active types, with excursions ranging from a civilized round of golf to extreme mountain biking, but even guests looking for rest will love the Llao Llao for its location, its elegant dining room and pampering spa. Llao Llao offers a variety of dining options, from gourmet versions of Patagonian specialties to the family friendly breakfast buffet with a view. Whether you’re looking for golfing or skiing, a romantic getaway or a family vacation, a gourmet retreat or a nature-lover’s paradise, Llao Llao has it all. The hotel is located amidst the stunning scenery of Patagonia’s Nahuel Huapi National Park, just 40 minutes away from Mt. Catedral’s excellent skiing. 36km/22mi from San Carlos de Bariloche Airport; Just 2-hour flight from Buenos Aires. 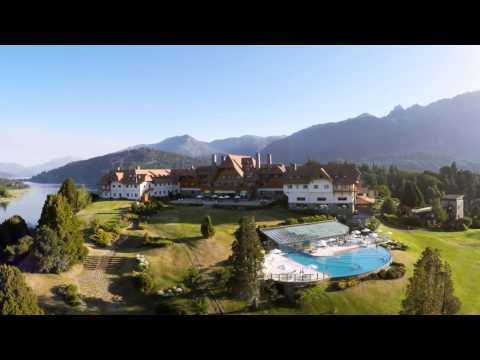 Owner Information: Llao Llao Resorts S.A.